As with all things, there is a wide spectrum of quality you can receive and value in what you pay for. Vision should not be an area to compromise! There are many options to select from when purchasing optical lenses. East Main Vision Clinic has made the decision to only offer the absolute best quality lenses! As an Independent Optometry practice, we are able to provide you with top quality lenses that are edged locally at Walman Optical. Our relationship with Walman Optical has allowed us to not only offer superior products, but the highest level of customer service. Your lenses will come with a 1-year scratch warranty at no additional cost to you! What is exposing us to Blue light? Digital devices (such as computers, TVs, cell phones, tablets). It’s not all bad; it is beneficial in the daytime! It boosts attention, reaction times, and mood. Beneficial turquoise light synchronizes our human biological clock (tells us when to wake up and go to sleep). That sounds great! What’s the bad news? We all know about how damaging Ultra Violet light can be, but some people are arguing that HEV may be just as bad- if not worse than UV! Just as it affects us beneficially in the daytime, consider the disruptive adverse effects at night with our sleep patterns! Some preliminary studies show it may be more departmental than just taking longer to fall asleep at night. Blue light suppresses the secretion of melatonin. Lower melatonin levels directly associate with obesity, diabetes, heart disease, and cancer. How can we protect ourselves from these light rays? 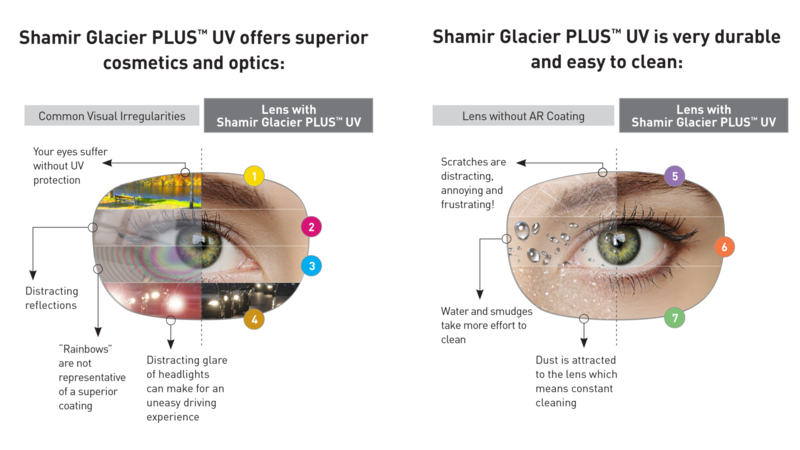 Anti-reflective treatments that reflect the HEV such as Shamir Blue Zero.™ Blue Zerois a nearly clear lens. By absorbing just the right amount of blue light, Blue Zero protects health without interfering with visual comfort. It also provides UV protection by effectively absorbing harmful UVA and UVB rays. Limiting your screen time will lessen the amount of blue light that you are exposed to. Blue Light (HEV) affects everyone from young to old because its exposure is nearly everywhere. How else can we protect our natural melatonin levels besides corrective lenses? Avoid bright screens a minimum of 2-3 hours before bed. ​​​​​​​Utilize the “Night Mode” feature on Smart Phones that limits blue light emission.